In the world of marketing, green is the new black. Have a recycling program? That's green. Use LED light bulbs? That's green, too. Heck, if you go so far as to encourage employees to carpool to work, you might as well be able to say your business is green. And yet, green marketing--that is, successful green marketing--isn't nearly as easy as it seems. It turns out there's more to eco-consciousness than simply being conscious of the environment. We asked a number of entrepreneurs and experts for insights on the components of green marketing that works. The gist: Green only yields green when messaging blends transparency, practicality and savvy. Marketing your business as green is a great idea--provided your customers are into that sort of thing. Executives at Bardessono, a luxury hotel and spa in Yountville, Calif., learned this the hard way. When the 62-room property opened in 2009, executives trumpeted the hotel's Platinum status from the Leadership in Energy and Environmental Design (LEED) program--the resort was one of only two such honored hotels in the U.S. While the facility was a hit among environmentalists and green-obsessed journalists, it struggled with perhaps its most important group of constituents: customers. The problem? Travelers accustomed to the luxury hotel experience perceived "green" to mean "sparse" and "uncomfortable" and booked elsewhere. "Our messaging was great for occupancy but not so good for the average daily rate," says Jim Treadway, the hotel's general manager. "We had lost sight of the fact that our core customers value a luxury experience above all else." Naturally, in 2010 Bardessono changed its tune, tweaking marketing messages to emphasize luxury first and green second. Almost overnight, bookings--at full price, mind you--soared. The lesson: Never assume everybody will love you just because you're green. "It took us a while to realize the best message for our customers was, 'We're a world-class hotel and, oh yeah, we're green,'" Treadway says. "That might not be intuitive, but when you consider that your customers are the top priority, targeting your messages to their lifestyle certainly makes sense." Describing something as "green" can be dicey, since the word often means different things to different people. In one instance, it could summarize an off-the-grid production facility powered by solar energy. In other cases, it could signify the existence of a telecommuting program that helps reduce a carbon footprint. Jenny Grayson, a Los Angeles-based consultant who helps companies go green, says it behooves companies to be totally honest and to define exactly what "green" means to them. "Everyone right now, from Clorox to Huggies, is marketing themselves as 'natural,' but what does that really mean?" she asks. "Environmentally savvy consumers can become quickly disillusioned with a company when it doesn't live up to its eco-friendly claims," or when it doesn't explain how it's eco-friendly in the first place. Personal explanations usually work best. Ava Anderson Non-Toxic, a personal-care-product manufacturer (and one of Entrepreneur's "Entrepreneur of 2011" award winners), explains on the company website how its founder, as a 14-year-old girl, became disillusioned with chemicals in beauty products due to their hazardous health effects. Bill and Jane Monetti offer similarly personal insights on the website for their company, Eco-Command, which produces GoFlushless, a spray that neutralizes the odor of urine and reduces the need to flush a toilet. The Monettis detail how the product was born out of necessity when they purchased a home in the environmentally sensitive area of Maryland's Eastern Shore. "Along with our new home, we acquired a well, septic tank, drainage field and an extreme awareness of every drop of water we use," they write. With this, it's easy to understand the company mission of "saving water, saving energy." No matter how well a company defines green, being green alone is not enough--there has to be some substance behind the messaging to make it work. Park Howell, president of Park&Co, a sustainable marketing firm in Phoenix, says that in the current economy, emphasizing how people can save their green by going green is the most effective approach. Is it good for my budget? Is it good for my family? Howell adds that in most cases, green campaigns should avoid the word green and avoid incorporating green leaves into a logo. "Really, these tactics are just camouflaging a brand differentiator," he says. "Finding another way to tell your story will always end up delivering a targeted message to the people you want to reach." In an age when just about anyone can find out just about anything about the inner workings of a company online, transparency is key. For this reason, it's important for companies that market themselves as green to operate sustainably in many of their day-to-day operations. At Green Apple Cleaners, a nontoxic dry cleaning business in New York City, this has meant no print advertisements whatsoever, steering away from the traditional approach within the industry. Instead, founder and CEO David Kistner has opted for virtual (and therefore paperless) services such as Groupon and Google Offers to bring in new customers. "Could you imagine if one of our coupons came in the mail?" he says, assuming eco-conscious customers wouldn't remain patrons for long. Other businesses have opted for different strategies. At Eco-Command, owners Bill and Jane Monetti have installed in their home water-efficient shower heads, aerators for sink fixtures and an Energy Star clothes washer. GreenChoice Bank, a green-themed bank in Chicago, issues debit cards with a 100 percent recycled plastic core and boasts electric car chargers in all of its bank parking lots. Consultant Shel Horowitz, author of Guerilla Marketing Goes Green, says it doesn't matter how a company embraces eco-consciousness, so long as it does so on some quantifiable level. "You need to walk the walk to some extent," he says. "The minute a customer calls credibility into question, that customer will start shopping somewhere else." One of the most important attributes of sustainability is reinvesting dollars and energy into the surrounding community. It's a simple step--but it's also an initiative many green companies overlook. In downtown Cleveland, Great Lakes Brewing Company invests in the community by sourcing local ingredients. Reinvesting in the community can take many forms. GreenChoice Bank offers flexible loan terms to commercial clients who build sustainably. Ben & Jerry's, one of the first green companies, continues to donate significant money to nonprofits more than a decade after it was purchased by Unilever. Great Lakes Brewing Company, a brewery in downtown Cleveland, has taken a different approach: It sources locally. All told, the brewery's restaurant uses local vegetables and herbs in dishes whenever seasonally available, as well as local eggs, milk, cream, butter and locally raised meats. Saul Kliorys, the company's environmental programs manager, says the brewery has gone so far as to manage and till part of the 16-acre Ohio City Farm in Cleveland, growing many of the herbs and vegetables itself. "Why source from elsewhere when we can get what we need right here?" Kliorys says. "Being green isn't always about making the best choices for the planet at large; sometimes it's about making the best choices for the people in your own backyard, too." While marketing your company as green has undisputed benefits, misrepresenting one's greenness--a process known as "greenwashing"--can be disastrous to a company's credibility. ConAgra, the food product company, is facing a class-action lawsuit for labeling its cooking oils as "natural," even though they're made with genetically modified ingredients. Then there's Sigg. The Switzerland-based reusable-bottle manufacturer told its customers that its products were BPA-free, even though the bottles contained the chemical in their liners. When news of this hit the mainstream media, sales dropped precipitously. Apparently, greenwashing is getting worse. According to the 2010 Greenwashing Report from the TerraChoice Group, an environmental marketing agency based in Ottawa, Ontario, more than 95 percent of all consumer products claiming to be green were found to commit at least one of the "Seven Sins of Greenwashing," which include not providing evidence, being vague or flat-out lying. The best way to avoid these claims, according to Shel Horowitz, CEO of Greenandprofitable.com, is to keep messages consistent and support every claim with incontrovertible evidence. "Transparency and honesty is the best approach," he says. "If you're accused of greenwashing and there's some stick to it at all, you're dead." With businesses in just about every industry vying to market themselves as green, it's natural to ask: To what extent do customers care? The answer depends on where you look. Some data indicates that increasing numbers of Americans are seeking out green products; according to the Organic Trade Association, organic food sales have grown about 20 percent per year over the last decade. What's more, Wal-Mart, that mass-market juggernaut, is now the world's largest buyer of organic cotton. 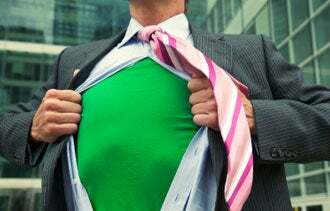 Still, when most companies gauge customers about what matters most to them, answers such as "green-ness" or sustainability frequently come in behind key issues such as usefulness and price. Saul Kliorys, environmental programs manager for Great Lakes Brewing Company in Cleveland, has taken surveys of this nature, and says green is always near the top but never finishes first. "On the whole," he says, "greenness doesn't sell products; products sell products." Still, to be fair, certain demographics appear to be more concerned than others with whether products are, in fact, green. Women, for instance, account for a majority of household spending, and many may be worrying about the chemicals in their kids' shampoo, or might be trying to avoid purchasing genetically modified food at the grocery store. The bottom line: Green likely isn't the sole factor determining customer behaviors in today's economy, but it undoubtedly is one of the few. "Customers want good-performing products at prices they can afford that are healthy for their families and easy to get," says Park Howell, president of Park&Co, a sustainable marketing firm in Phoenix. "If a product has met all of those considerations and it's green, that's even better."